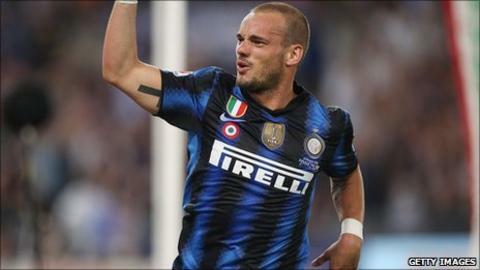 Manchester United manager Sir Alex Ferguson has said the club have "no real interest" in signing Inter Milan midfielder Wesley Sneijder. The Italian club denied receiving an offer from the English champions on Wednesday, but reports suggested the Dutchman remained a target of United. However, Ferguson said on Thursday that there was "no real interest at this moment in time" for the 27-year-old. United have signed Phil Jones, Ashley Young and David de Gea this summer. The combined cost of that trio is reported to be about £53m, but funds are said to still be available for the Red Devils to further strengthen their squad. The retirement of midfielder Paul Scholes, in particular, was thought to have created a hole that needed filling, but Ferguson played down worries that could prove a difficult task. "He was such a great, consistent player for us. I don't think we will find another Paul Scholes," said the Scot. "But hopefully we can replace him. Maybe we will find a different type of player. Manchester United do that. "Time and time again we have faced this problem. But eventually something turns up, either through our youth system or we will identify someone." Newspaper reports have long insisted that Sneijder is a top target for Sir Alex Ferguson's side. Various articles on Wednesday and Thursday claimed a deal of around £35m had been agreed between United and Inter, with Sneijder accepting terms on a £190,000-a-week contract. But those reports appear to be wide of the mark. Only on Wednesday, Inter technical director Marco Branca insisted the Milanese club had not received any official offers for the Netherlands international, saying: "No, there's not been an official offer and there has never been the intention to listen to them. "There are no updates. He is not for sale." Ferguson added on Thursday: "I have not been involved in this situation. There is no real interest for a lot of reasons. There is nothing I can tell you about it." Furthermore, in early June, Sneijder told Inter's website: "At the moment I am very happy here, and I don't see why I should leave." Sneijder helped the Netherlands to the 2010 World Cup final in South Africa and won the domestic title, domestic cup and Champions League treble with Inter under Jose Mourinho in the same year. And, speaking to BBC Sport's chief football writer Phil McNulty on Monday, former Manchester United and England defender Gary Pallister insisted Sneijder would be "a huge hit" if he moved to Old Trafford. "Maybe he is the sort of player that has been missing from United's side since Roy Keane left," he said. "He will bring a bit of steel in there. "There are no doubts about his temperament and ability to succeed at Old Trafford. He has played at the San Siro and been a success. "Sneijder's pedigree is up there with the best. He's got great quality, a good engine. He has got the experience to go straight into the side and make an impact. "United have got young players coming through but they have lost a great player in Paul Scholes and they need to replace that."